New Orleans Pelicans forward Anthony Davis has requested a trade and will reject any contract extension the team offers him, according to Adrian Wojnarowski of ESPN. This gives the Miami Heat another chance at landing a franchise-changing superstar, having failed in their attempts to acquire Jimmy Butler from the Minnesota Timberwolves earlier in the season. The price the Heat will have to pay to get Davis, who is a five-time All-Star and three-time All-NBA selection, will be steep. Miami would likely have to part with all three of the following young assets: Josh Richardson, Justise Winslow and Bam Adebayo. Richardson, Winslow and Adebayo are all currently key parts of the Heat’s future. Richardson is averaging 17.5 points (first on the team), 3.7 rebounds and 3.9 assists per game this season. Winslow, who in recent weeks has shown that he is capable of being a cornerstone for the franchise, is averaging 12.5 points, 5.3 rebounds and 4.1 assists per game this season. As for Adebayo, he is averaging 8.0 points and 6.7 rebounds per game in a backup role. In addition to multiple young assets, the Heat would likely have to part ways with multiple draft picks. Miami doesn’t have a 2021 first-round pick, having sent it to the Phoenix Suns in the Goran Dragic trade. The Suns proceeded to send it to the Philadelphia 76ers this past summer. Having already traded their 2021 first-round pick, the Heat are not allowed to trade one of their 2020 or 2022 first-round picks due to the Stepien Rule, which prevents teams from trading away their first-round picks in consecutive years. The Heat could trade their 2019 first-round pick along with either their 2023, 2024 or 2025 first-round pick. Miami could also potentially use a combination of a first-round pick along with two second-round picks in an attempt to entice the Pelicans, but two first-round picks are always more appealing. The issue with giving up these pieces for Davis is that the Heat would then likely put themselves in the same position the Pelicans are in now, which is that there is not enough complimentary talent around Davis to compete for a championship. 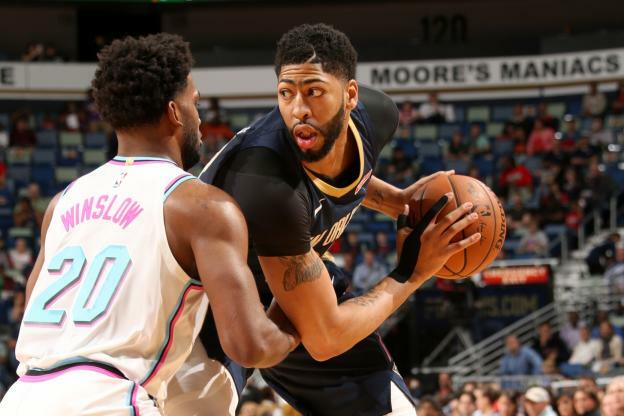 Davis’ agent, Rich Paul of Klutch Sports, explained to ESPN that the main reason the University of Kentucky product wants to leave New Orleans is that he wants to compete for a championship. Davis has two years left on his contract, but he does hold a player option for the 2020-21 season and there is no guarantee that he would re-sign with the Heat, should they acquire him. The seven-year pro has been fantastic so far in his NBA career, averaging 24.0 points, 10.6 rebounds, 2.1 assists, 1.4 steals and 2.4 blocks per game. Heat president Pat Riley has been known to go after superstars, but time will only tell if he will be willing to give up the necessary assets in order to acquire Davis.